Los Angeles may be the most populous city in the U.S. state of California, but few people are visible on the streets. This is a city where most travel by car rather than stroll about on the sidewalks. Given the long distances, it’s almost impossible to survive without wheels. Mexican-American tattoo artist Mr Cartoon embraces this sense of remoteness. His tattoo studio is located in a sort of industrial area that’s almost as barren as a desert. A few parked cars provide the only signs of humanity. From the moment we enter his studio, we can hear the buzz of a tattoo needle coming from upstairs. And we can see his style not just on skin, but also on CD covers and video games such as Grand Theft Auto. 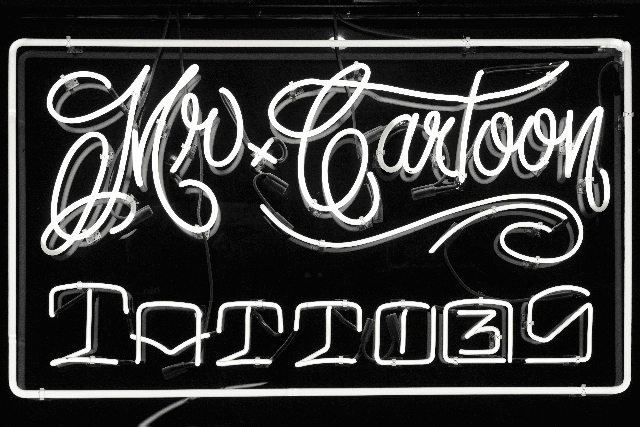 We sit down with the legendary tattoo artist on a balcony that straddles the two parts of the building – his studio and a sprawling garage for his cars.